Hot Safari is a new amazing slot powered by the Pragmatic Gaming. It has 5 reels along with 25 paylines and is inspired by all the cute animals residing within a Safari park. The slot reels are quite transparent and are portrayed against a safari park backdrop. The slot min and max bet value range from 25p a spin to £125.00 a spin. Overall, the slot is fun to play and offers an RTP of 96.04% to its players. Go On A Ride With Hot Safari! Visually, the Hot Safari slot symbols are very well crafted and relate with theme of the slot. The reels include usual low value playing cards alongside with gazelle, meerkat, rhino, elephant and zebra as high value symbols. Among them, the elephant icon is the most rewarding icon and will give 400 coins if 5 of them land on slot reels. The Hot Safari slot is readily available on all devices including androids, pcs and tablets. The mighty lion depicts the slot wild and will replace all symbols except the scatter. Moreover, when these wild lands on the centre position, then it will get expand so as to fill that entire reel. The players will notice a sixth reel that includes a variety of multipliers ranging between 1x to 10x. On each winning spun, the original payout will get boosted by the value displayed in multiplier reel. The Hot Safari slot also includes a super wild bonus feature in which players will get rewarded with 1 respin along with 1 wild attached to each reel. The Baboon head acts as the Scatter icon and when players land more than 3 of them on slot reels then it will activate the Free Spins feature. Once it gets activated players will be rewarded with ten free spins, but players can win more by landing additional scatters on slot reels. The perfect scenario for players will be when they land any wild icon on the centre position of every row in conjunction along with the max x10 multiplier. This happy circumstance will award them an enormous payout equalling to 4,000 times of the stake. 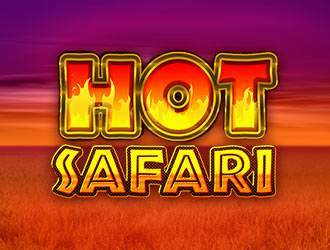 Hot Safari synthesiser soundtrack, high-quality animations, and its unique bonus features have made this slot game quite addictive for the casino players. The slot might feel hard to understand in the beginning but once you are through it, you just cannot leave. The slot has a high variance and offers a free spin round which makes the gameplay more interesting.